Vials can sometimes be one of the most challenging products to label due to the size of the vials and the specialized product handling required. Often data management software is needed to meet the traceability requirements of government mandates. An error in labeling of vials can lead to expensive and time consuming recalls. Trust LSI to provide your vial labeling solution the high-tech dependability your production line needs. From complex robotic systems to low volume semi-automatic vial labeling systems, LSI has the solution for you. 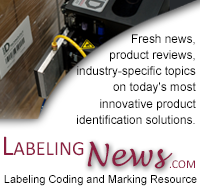 For vial labeling, product handling and control is key. LSI offers a range of product handling solutions, from adjustable cradles for semi-automatic labelers to starwheel and horizontal infeed systems for medium and high speed applications. These can be integrated with label applicators or label printer applicators for either preprinted labels or variable information labels, such as bar codes. Contact a Sales Representative to discuss your vial labeling needs and let them design a labeling solution to fit your application.